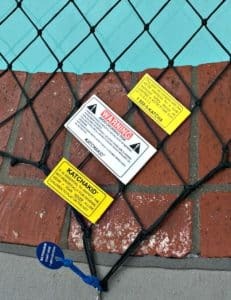 With pool barrier codes mandated in most US States to be confident of a high level of quality and safety, select pool safety covers that are manufactured and installed to the most referenced code for manual pool safety covers – the ASTM F1346 -91 statute. Who and What is ASTM International? Originated in 1898 by a group of railway engineers, to deal with issues concerning their steel rails, ASTM International has become one of the largest classification and standards developing organization in the world. Standards and classifications are developed within voluntary member committees. ASTM performs no part in approving, sanctioning or enforcing compliance with its standards. The standards become mandated when referenced by a society, association, or legislative agency. To demonstrate a product fulfills the terms of a standard, a product can be tested by an independent testing laboratory. The laboratory will then issue a full report with confirmation of the compliance. Why is the ASTM F1346 – 91 Standard Important? ASTM F1346 -91 Standard Performance Specification for Manual Safety Covers. ASTM International developed this standard to reduce the risk of drowning of children under five years of age. This standard is used by many States and Cities as the mandated pool barrier code, as well as referenced nationally by day-care, adoption and fostering agencies. The static load test for weight support. The cover should be able to hold a weight of at least 485 lbs (the estimated average weight of 2 adults and one child) to permit rescue operation. Perimeter Deflection Tests for entry or entrapment between the cover and the side of the pool. The cover must demonstrate that any opening is sufficiently small and strong enough to prevent the test object being passed through. The Surface Drainage Test that safeguards against a dangerous amount of water collecting on the cover’s surface. Labeling requirements must include basic consumer information such as the warranty information, the appropriate warnings as described in the standard and acknowledge the product as a safety cover. How Can You Tell If Pool Safety Cover Meets The ASTM F1346 Standard? A pool cover company’s website, literature, and brochures will state their ASTM F 1346 -91 safety cover compliance. The pool cover itself will have the correct labels attached, and the company will be able to show laboratory reports to further prove their pool covers compliance to the standard. F1346-91 for manual pool safety covers. The Katchakid pool net cover meets all the criteria for the standard’s demanding series of performance tests and labeling requirements. 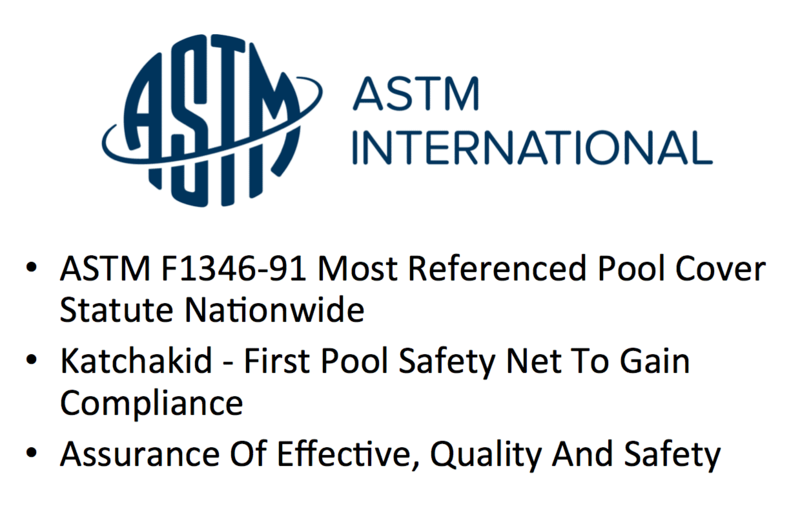 While already a quality and time tested product, conforming to the ASTM F 1346 -91 code further provides Katchakid owners assurance that they have one of the best forms of pool protection assisting to reduce the drowning risk of small children. All pool safety covers are supplementary pool safety aids and not a substitute for the undivided and constant supervision of an adult. Pool covers can never replace adult supervision nor can they be a guarantee against drowning or other accidents. Always replace your cover after swimming. Experts agree that multiple layers of protection offer the best protection against drowning and near drowning incidents. The most at risk are children under 5 years of age so always be extra vigilant with children in this age group. Learn more on how the Katchakid pool safety net cover can make your pool a safer place or contact us for a free in-home estimate in the markets we serve.